My story begins with Sthoko, a young South African woman who gave my feet a wonderful pedicure after walking in the Drakensberg mountains in South Africa last week. Sthoko is one of the new generation South Africans, proud of her heritage and looking forward to a happy and successful economic future. Sthoko is educated and has a good job in a resort spa. She hopes to find a good and decent man to marry and start a family. But for now, she lives in a remote region of South Africa where three provinces meet at the escarpment. Mobile phones are plentiful in South Africa, but outside of the metropolitan areas, coverage is sparse and internet access is patchy to say the least. Satellite TV provides most of the news, but it’s expensive. Sthoko is lucky – she can read so will be able to find out about current affairs for herself. She wonders, for example, why the Zimbabwean people are not rising up en masse against Robert Mugabe. But there are many others who are not so fortunate, who are unable to read or write. Which is why education is so important for South Africa’s next generation. In the eight years since we were last there, infrastructure has deteriorated. Roads in particular are most badly affected. If children are unable to get to school, or are unable to communicate with a teacher via the internet, using Skype for example, how on earth can they be educated? We spent some time with Megan Bedingham at The Cavern Resort. Megan and her family have set-up and built a school, The Royal Drakensberg Primary School, for local children. This local school means that the parents of little children no longer have to find the money to travel an hour by taxi to school. No money means no school for many children. The South African government provides no financial support for the school, so it must find funding for teachers and supplies from other sources. Parents are, however, expected to pay R400.00 (about £30.00) a month for each child at the school, and that is a huge sum of money for most of these parents whose main employment is at The Cavern Resort or the neighbouring hotels. The remainder of the school fee is generated by tireless fundraising. The problem for the education of girls is even more desperate. In this area of South Africa, Zulu tribal traditions are very strong, which means that boys are born with more advantages than girls. Girls are still growing up and working in domestic service. Of course, this will always happen, but it is said that the education of children is only as good as that of their mother. So, unless we can educate the mothers of tomorrow, children in South Africa will never rise above the basic level. I believe very strongly that there needs to be more focus and commitment on educating girls, empowering them through education, to healthier, happier lives as confident women in South Africa’s future. The newly appointed health minister Dr Aaron Motsoaledi has declared his aim of an HIV-free generation. The recent public awareness ads are hard hitting and make it clear that responsible sexual practice will be a major contributor to halting the spread of the infection. South Africa cannot afford the widespread use of anti-retroviral drugs forever. While in South Africa, I listened to a debate on broad-based black economic empowerment, which the local people refer to as BBEE. Eighteen years after Nelson Mandela and the African National Congress came to power, this is still the main concern amongst young black South Africans. M ay is Africa month, a celebration of all things African. But everyone is wondering if this generation will enjoy true economic freedom and independence, that which previous generations have fought for. 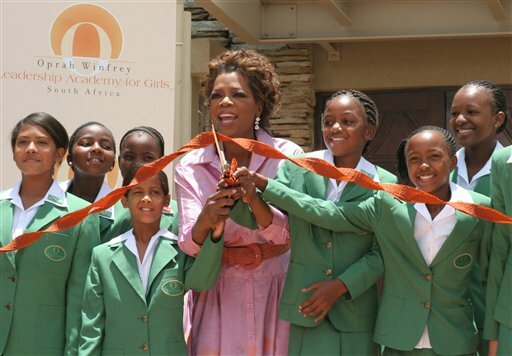 Oprah Winfrey has started a girls’ school in Johannesburg to address just this issue. I have previously written about Thandulwazi, a maths and science academy in Johannesburg. And now, I’m asking you to consider the Northern Drakensberg Khanyisela project. Khanyisela means to enlighten. Thandulwazi is the love of knowledge. Two more projects inspiring brighter futures for South Africa and its children.